Meet Ram Singh. Came to Kolkata with his father when he was of around 16 years of age. 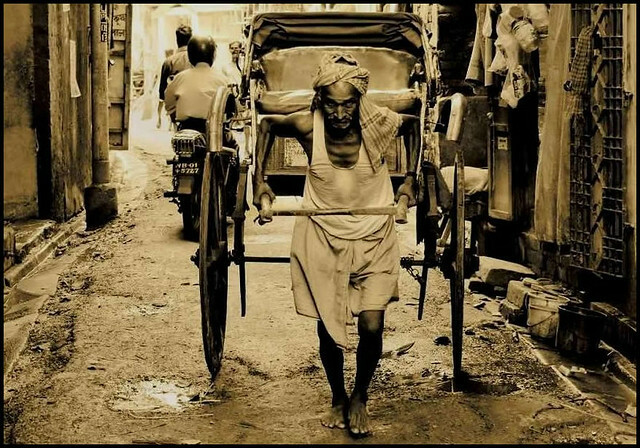 His father was a porter in Howrah station for some months, then took up this job of rickshaw pulling. Soon after, doctors confirmed that his father is suffering from Tuberculosis. It was not long when his father died of TB and malnutrition. Ram gripped the handles of the rickshaw the very next day he came back from crematorium. His family stays in Bihar. Ram visits them once in every six months. He regularly sends money order home through a marwari seth as he does not understand the complex process. He pays a good percentage to the middleman. Government and few educated people are raising voices to ban these rickshaws from streets of Kolkata. Ram chuckled, did not say anything at first when I asked his views. After a long pause, he said in hindi; "the world does not care about what he thinks, what he says." I did not ask him anything else.